Explore the most popular tourist attractions in Thailand that is The Temple of the Emerald Buddha and The Grand Palace, Wat Pho and taking a boat to Wat Arun which will impress you. So !! Let's enjoy the day out and open new experience together. The first attraction is The Temple of the Emerald Buddha, we will go inside to the Chapel to pay respect to The Emerald Buddha and walk around to sightseeing other attraction in Wat Phra Kaew. Next to is The Grand Palace which is a magnificent complex of buildings. 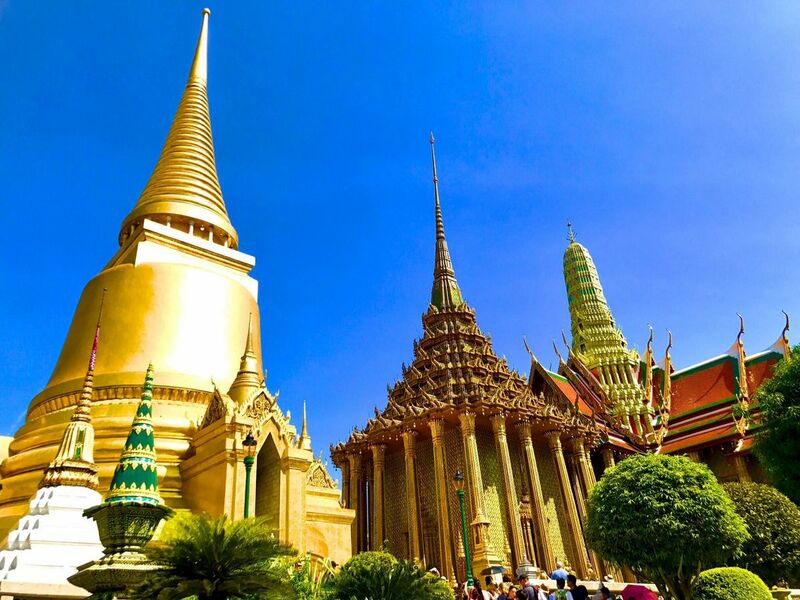 The Grand Palace is made up of numerous buildings, halls and pavilions. This place is very attraction to visit. Move on to Wat Pho. Inside the Chapel you will see a 46 metres long of Reclining Buddha. It's very beautiful. This temple is well known as a school of traditional Thai massage. If you would like to relaxing with real Thai massage. So follow your heart. Move on to Wat Arun. Situated on the west bank of the Chao Phraya River. Arrive the hotel safe and sound. It’s my pleasure to be your Thai friend here. Throughout the trip I will take care of you as my friend. We will open new experience at Bangkok together. You will get free stunning photos and also Polaroid photo for souvenir which taking by my duo. As this is Thailand’s most highly revered temple there is a strict dress code. Please dress respectfully which means long pants or skirts and long sleeved shirts.. Sarong are for rent at the entrance but better dress appropriately to avoid queue. Nusara is the best guide that I’ve ever met. She is very thoughtful smd sincere and patient. Would definitely choose her as a guide again! Thank you so much for your review and as you said you come to Thailand a lot, we hope to meet you once you come back. We have a great day out together even it's very hot haha. The most popular at Bangkok, visit The temple of the Emerald Buddha, The Grand Palace and the Floating Market. An amazing and unforgettable experience! Nusara (and her husband Korn) made our trip to Bangkok seamless and incredibly memorable. My husband and I only had one full day in Bangkok. We had never been to Bangkok or Asia for that matter, so there was a lot we wanted to try and see in a short amount of time. We contacted TakemeTour to customize an individual itenerary in order to maximize our time and overall experience. It was the best decision we could have made! TakemeTour was incredibly responsive and very easy to to work to with. We were paired with Nusara for our tour. She immediately contacted us via e-mail to introduce herself, which made us feel very comfortable and confident with our decision of booking the tour. Nusara confirmed our itenerary and stated she would meet us in the lobby of our hotel at 7:30 and wished us safe travels. Through her e-mail communications we could tell she was a very polite and friendly and we looked forward to meeting her once we arrived in Bangkok. There in our lobby promptly at 7:30 on Saturday morning Nusara greeted us with a big beautiful smile and "Swat de ka". Nusara speaks English very well, which was a tremendous help for my husband and I, because neither of us knew any Thai. However, that quickly changed thanks to Nusara! She walked us out to her car and introduced us to her husband Korn. He was just as friendly and welcoming as Nusara. Nusara stated that he was going to be driving us to each of the places that we wanted to see on our tour. This worked out beautifully! The traffic in Bangkok is crazy - the cars, trucks, buses, tuk tuks, motorbikes, pedistrians all zip around in what appears to be a totally unorganized and chaotic state yet we never witnessed any accidents - so obviously, they all know what they are doing. I just know I could never drive there and I've lived in New York and Chicago. Korn was able to navigate through the busy traffic and delivered us to each destination without any problem. This allowed Nusara to easily chat with us and help us learn a few key phrases in Thai during our car rides. The car was immaculate and they provided us chilled bottle water and a Thailand tour book to enjoy during our ride. Nusara also gave us a delicious traditional Thai breakfast for those commuting to work. She explained that her parents make the breakfast to sell. It was incredibly flavorful and fun to learn what locals eat while commuting to work. Our itenerary was incredibly full, but we never felt rushed at any of the sights. Korn dropped us off at the entry of each sight and Nusara would quickly and efficiently go and pick up our tickets. This alleviated all of the hassle of having to wait in line for tickets and navigating through the entry points. The way Nusara and Korn had everything organized made the trip so much more enjoyable for us. It was so seamless! Nusara took time to explain the history of the various sights we toured and provided plenty of time for photos and questions. She took numerous photos for us; which was really nice since it allowed both my husband and myself to be in the photos together. After almost 8 hours of sightseeing we parted ways. However, before the tour ended Nusara so graciously offerred to accompany my husband and myself to an evening show of the history of Thailand. The show looked phenomenal and it was so sweet of her to offer to go with us. If we weren't so exhausted from our travels from the US the day before and all of our sightseeing that morning and afternoon we would have definitely gone see it - hopefully, next time! We can't say enough about our wonderful experience with Nusara and Korn. We would absolutely recommend Nusara to anyone looking to book a tour. You won't be disappointed. We consider our day spent sightseeing with Nusara and Korn as one of our fondest memories from our 14 day Thailand, Malaysia and Singapore trip! Thank you so much for your review I love it. so hope we can meet again in one day.